Demand seen as part of a trend of bands suggesting songs for politicians like Ted Cruz to use, rather than just demanding they stop using certain tunes. 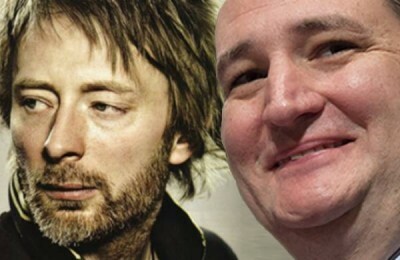 Radiohead frontman Thom Yorke has finally put his foot down and used a court order to demand Ted Cruz immediately cease not using “Creep” during campaign events. Yorke argued that although Cruz is uniquely suited to enter every room ever to this song, he was only being ordered to use it during official campaign events. Yorke offered Cruz’s failure to use the song as evidence that he doesn’t belong on the national stage. Rather than use the courts, The Lonely Island band said Cruz’s continued failure to use their song “The Creep” would result in a punch in the jeans. Contributed by Stubhill News: News you can read! Check 'em out at http://stubhillnews.com.